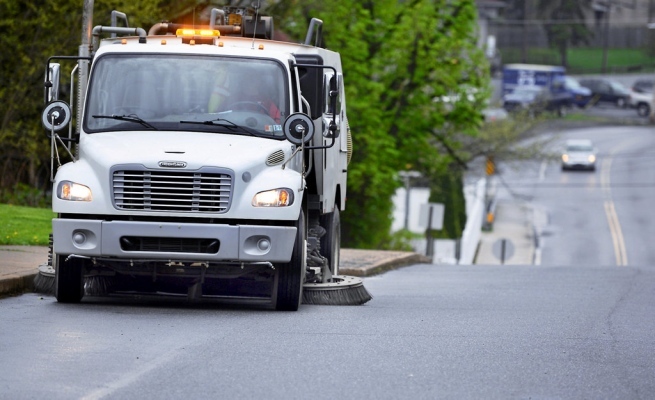 Scranton’s annual street sweeping program began last week and will run through Aug. 24. Scranton, the sixth-largest city in the Commonwealth of Pennsylvania, has been sweeping streets since the 1960s and used to run two street sweepers years ago, but each was smaller and older than the current Schwarze A7 Tornado. The A7 Tornado does a great job, but the people do not know to move their cars off the street, so the roads are not always getting adequately cleaned. The hopper holds about 2,500 pounds of dirt and a typical workday involves sweeping up about four truckloads, or 10,000 pounds of debris. The debris is then dumped in a pile at the Department of Human Services complex and eventually disposed of in a landfill. At times the sweeper gets diverted from the schedule to other tasks, including sweeping up gravel washed onto roads in heavy rains, and making last-pass, clean sweeps of milled roads right before paving starts. Councilman Wayne Evans, who spoke during an April 30 council caucus, said he’d like to see the city have two sweepers, with one operating on each side of the Lackawanna River.